A remarkable scientific experiment is about to leave Earth on a six week journey that’ll end a million miles away. The LISA Pathfinder marks the beginning of humanity’s outer space hunt for the elusive gravitational waves first predicted by Albert Einstein a century ago. Gravitational waves are ripples in the fabric of spacetime caused by the most energetic events in the universe—supernovae, black hole mergers, and the like. Unlike electromagnetic radiation, which is scattered and distorted by matter, gravitational waves penetrate everything without being affected, thus offering window into otherwise inscrutable cosmic phenomena. There’s just one problem: the signatures of gravitational waves are extremely faint. Imagine receiving the slightest of pushes, your position changing by a millionth of a millimeter. You wouldn’t notice the difference at all, but that’s the sort of force physicists are trying to detect. As you might imagine, our bustling, crowded planet isn’t exactly the ideal laboratory. “Getting away from the Earth, you get away from the noisy gravitational field due to the motion of the oceans and the atmosphere and the vibrating Earth and cars,” Weber said. So space is exactly where we’re going. 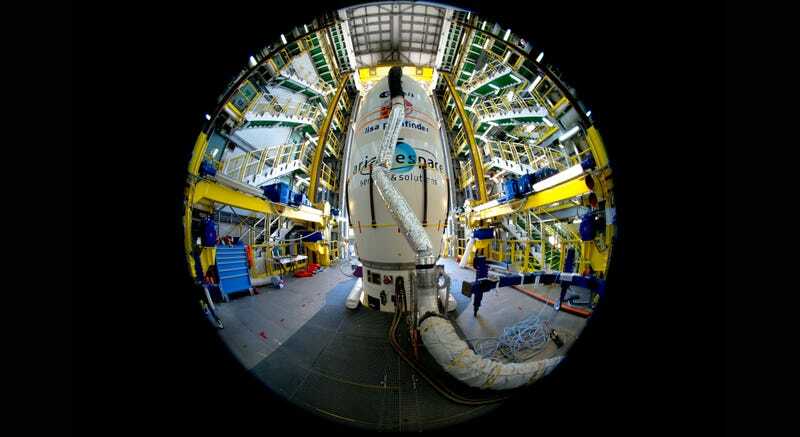 This week, the European Space Agency will launch the LISA Pathfinder, a prototype observatory to test technologies needed for gravitational wave detection. Its goal is simple: using laser interferometers, the spacecraft will attempt to precisely measure the relative positions of two 1.8 inch gold-platinum cubes in free fall. Housed in separate electrode boxes a mere 15 inches apart, the test objects will be shielded from the solar wind and all other external forces, such that the tiny motions caused by gravitational waves can (hopefully) be detected. We won’t actually see gravitational waves with LISA Pathfinder—the experiment is too small. Rather, as Weber puts it, “we will demonstrate that you can make measurements of the relative position of two test objects at very high precision.” We’re gunning for a hundred millionth of a millimeter. Eventually, the ESA plans to build a large space-based observatory that takes precise measurements on test objects separated by hundreds of thousands of miles. On those sorts of scales, we could cast a much wider net, measuring gravitational waves down to the millihertz range. “At these frequencies, there is expected to be a wealth of astrophysical and cosmological sources, providing us with signals from some of the most violent and massive events in the universe,” Hewitson said. The LISA Pathfinder is set to launch on a Vega rocket from Europe’s spaceport in Kourou, French Guiana. (The launch was planned for yesterday, delayed due to a technical issue, and is now set for Thursday morning at 5:04 am CET. We’ll update if the schedule changes.) After entering low Earth orbit, the spacecraft will separate from the rocket’s final stage and begin transmitting its first signals to the ground. Over the next two weeks, the craft will undergo a series of orbit-raising maneuvers, propelling it on a six week journey to the L1 Lagrange point, a position of stable orbit between the Sun and Earth’s gravitational pull. By early March, LISA Pathfinder should be ready to start taking measurements. Its science team will spend several months conducting tests to understand limits on the laboratory’s measurement precision, including stray electrostatic forces, cosmic rays, and—literally—the random motion of molecules within the test masses themselves.